- Ashkan Mokhtarian was expected to face Jenel Lausa at the event. However, Mokhtarian pulled out of the fight in early May citing injury. He was replaced by Ulka Sasaki on May 8. - Nadia Kassem was scheduled to face Yan Xiaonan at the event. However, Kassem pulled out of the fight in mid-May and was replaced by Viviane Pereira on May 17. 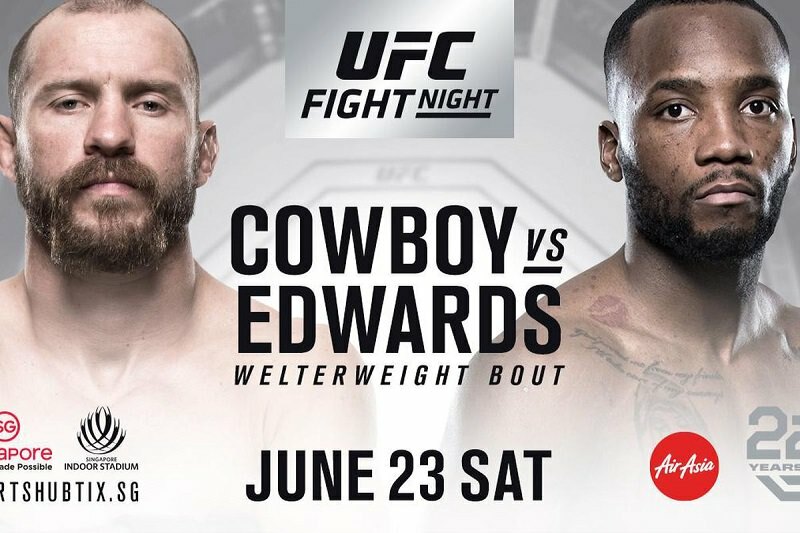 Edwards used to be known as a striker (kicker mostly) when he entered the UFC, but changed his style to wrestling-heavy once he took his first UFC loss. That being said, Cerrone has good TDD, a decent double leg TD, and his BJJ is way better than Edwards. Cerrone is also the better striker, has better cardio, is taller + longer, and is more diverse with his strikes/combos. If Cerrone can avoid getting swarmed in R1 -- which is how he usually loses -- then he should win this. Getting him at plus odds in this match-up seems like a good play (I favor him to win outright just cuz Edwards isn't known as a finisher, lacks punching power, is medium output as a striker, lacks a dangerous BJJ game, and slows down in some fights). My favorite underdog on this card is Yan Xiaonan. I pick her to win outright, and got her at +204. She is taller, longer, the more diverse striker, has a good sidekick, has a good chin, and good cardio. Pereira took this fight on 1 month short notice and is flying from Brazil to Singapore. I think Yan's sidekick, punching output, and power will give her the advantage in this fight (especially her sidekick, and being the Chinese fighter fighting in Singapore). Sasaki did what was expected of him against a limited opponent. I like how he quickly spun to Lausa's back in R2. I ended Q2 of GambleMaster in 3rd place. I had a couple bad calls this season (Zak Cummings being my biggest loss), but I finished the season strong with my Yan Xiaonan +204 and Matt Schnell +167 bets. Registration for Quarter 3 is now open. I'll play in it again.